A week after our last trip over Lancashire's eastern border, it's to Yorkshire we head once again, this time to face Wakefield, nee Wakefield & Emley, nee Emley – the club that once achieved great success under our current manager Gerry Quinn. While we haven't played the club in their current guise, we have played them in their old one; losing all four of those fixtures in the early 1990's. Not that that should be any cause for alarm. I mean, when has history ever repeated itself? That said Yorkshire hasn't been a particularly happy hunting ground for us this season. A draw against Harrogate R.A. back in September being our best result in a total of six league and cup games played on t'other side of t'moors. Our hosts currently sit three places and nine points above in ninth position and have been picking up some good wins on their travels. Doing the same at home though has become something of a stumbling block recently, and last Tuesday's 1 – 0 defeat to Curzon Ashton was their third match in a row at College Grove in which they've failed to score. Mossley on the other hand haven't kept a clean sheet for twelve matches so at least one of these statistics is going to be consigned to the dustbin by 5:00pm on Saturday afternoon. Unless the match is postponed of course. Finally, just in case you don't know,Wakefield’s home is shared with Wakefield amateur rugby league side and not their professional neighbours – the Wildcats. So so don’t get confused and turn up at the wrong ground. You have been warned! Prediction: Having seen Wakefield first hand recently (if you’re interested you can read about it here) I’ve got to admit that this could very well be another tricky tie, even after taking into account their current home form. As I mention in the link contained in the last sentence (that one you have no intention of clicking), they have the type of players similar to the ones that have caused us trouble in recent games. Still, triumph through adversity and all that so a win for the team from the Red Rose side of the Pennines. I've a feeling March is going to be a good month for us results wise. So, how many of you got asked "Did the earth move for you last night?" by someone smugly under the belief that they were the only person to have thought that one up today? If your response to that question was yes, can I ask the rhetorical question, "Weird wasn't it?" As I lay on my shaking bed, watching a glass of water and my spectacles inch themselves towards the edge of the shelf next to me, I've got to admit that 'earthquake' was not the first thing to cross my mind. Never having knowingly experienced one before the only point of reference I had for this particular kind of situation was one viewing of 'The Exorcist' many moons ago. After asking myself, what would Father Merrick do? I was just about to shout out "The power of Christ compels you" and set off on the hunt for the Gideon's Bible I got given at school when everything stopped shaking and, moments later, the noise (a combination of a roaring/rumbling/rushing sound) disappeared as well. Swiftly coming to the conclusion that the seventh seal hadn't been opened as Judgement Day is likely to last more than ten seconds (and be a tad noisier in the screaming stakes) it dawned on me that what had happened was an earthquake. Or as it's more commonly known in Britain, an earth tremor. As numerous radio stations began to interrupt their programmes to read out e-mails from people all over the country wondering if there had indeed been an earthquake, I turned on Sky News to be greeted by a whole host of retina scorching red and white 'Breaking News' strap lines running across the screen. Surely at night time they can use something in more of a pastel hue to announce breaking news so that those switching on aren't left stumbling around like they've just witnessed the meteor shower in 'The Day of the Triffids'. With reports coming in from all over the place about the tremors, the newsreader noticeably began to get excited, no doubt in the belief that this could be one of the career making moments. That excitement was visibly replaced by one of disappointment when it became obvious from the calls they were putting on air that the main story was going to be nearer 'budgerigars and other pets go a bit mental' rather than 'thousands dead - London okay'. Her promotion to daylight hours could be some time away too judging by the following piece of improvisation when the information on where the tremors emanated from: "We're just getting reports that the epicentre is 15 miles north of Lincoln. We're just waiting for confirmation whether it's north, south, east or west of Lincoln"
Still it's very good news that no-one was seriously hurt and even better news for the chimney pot repairmen of Lincolnshire, Humberside and South Yorkshire. Mossley’s search for their first win since the final Saturday of 2007 will continue into its third calendar month after the Lilywhites, for the second time in February, returned home from a fixture against a side that had just dismissed its manager with no points and three goals in the against column. Even taking into account the recent upheaval on the sidelines at Bradford Park Avenue, this was always going to be a difficult test for the team from the western side of the Pennines and so it proved. That said, despite the first chance of the match falling to the home side with less than sixty seconds gone, it was the visitors who provided the game with its first spell of concerted pressure. Some neat interplay in the opening ten minutes led to Gareth Hamlet firing wide of the upright and efforts from Lee Blackshaw and David Boardman taking similar routes past the target. Unfortunately it was a passage of play that Mossley could neither sustain nor repeat. Whilst it’s true that Mossley did have lengthy spells of possession throughout the remainder of the game, the failure to create even half-chances with it, let alone shots on target, meant that ex-Lilywhites keeper Jon Worsnop had little to do while stood between Bradford’s posts. However it was the Lilywhites who almost opened the scoring when Dean Johnson’s errant back pass had Ashley Connor scrambling across his goal line in order to prevent the centre half from having the initials O.G. next to his name on the score sheet. The Mossley keeper was powerless though to stop Bradford taking the lead in the 24th minute; Lincoln Adams outpacing the visiting defence before firing past Connor from the edge of the penalty area. The killer second goal arrived less than a minute before the interval and not without its share of controversy. The linesman had stood signalling that a Bradford player was offside for nearly fifteen seconds when the referee gave the home side a soft free-kick; a decision that initially had the Avenue players retreating back to their own half in the belief it had been given against them. 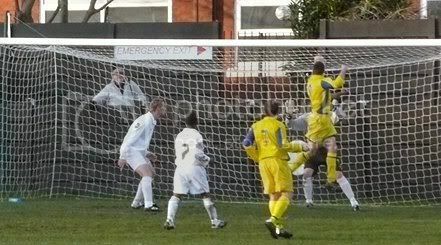 Whilst the circumstances surrounding the awarding of the free-kick can best be described as contentious, the was no denying the quality of Nathan Wharton's execution of the set-piece; the former Stalybridge and Hyde midfielder bending the ball over the wall and beyond the reach of Ashley Connor from 25 yards . Ashley Connor tries his best to keep out Wharton’s free kick but to no avail. The second half offered little different from the first with Mossley making heavy work of threatening Bradford's goal whilst some poor finishing, good goalkeeping and a succession of block tackles prevented the home side from posting a score that wouldn't have looked too out of place at the nearby Grattan Stadium , home of the Bradford Bulls. With a little over quarter of an hour remaining Avenue did manage to find the back of the net once more though it had a healthy dollop of fortuity about it; Leon Henry's attempts to block Ross Clegg's shot altering the trajectory just enough to take it over Ashley Connor’s dive and into the net. Some will blame the difference in financial resources for the defeat (Bradford's wage bill is reputed to be nearer to five figures than three), others the referee. And whilst it's true that both undoubtedly had some part to play in proceedings, the main factor is that Mossley just weren't good enough. Our primary problem at the moment appears to be that, to employ a poor analogy, we’re a lot like a jigsaw puzzle in that we come apart in the box. No matter how good our approach play is (and at times it’s very good) the spanner in the works is that it almost seems as if everyone’s afraid to have a pop at goal; that instead of taking a shot we’re always on the look out for that at extra touch or pass while the goal is a-gaping. Add in the propensity for giving the ball sloppily away in dangerous areas and the combination is one not conducive to winning matches. However they are things that are easy to rectify, mainly through confidence and belief. But as those tend to come through winning matches, it’s a vicious circle that we currently find ourselves in. It’s Yorkshire Mossley return to next week for an equally tough looking fixture at Wakefield and unless they can rediscover their early season form and lose the indecision when in front of their opponent’s goal, that long sought first victory of 2008 is going to be later rather than sooner in coming. On the bright side, even though we’ve only taken 2 points out of a possible 24, things still aren’t as bad or as desperate as they were at this time last year. 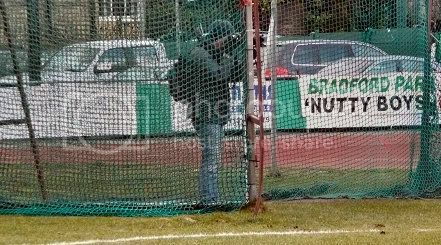 Why is Smiffy camouflaging himself in the netting used for the hammer throw? Discus. Apologies to anyone visiting Mossley80 in the hope of seeing a report on the Bradford game but I haven't finished it yet. I will hopefully have it up on here with a few pictures some time tomorrow, Tuesday at the latest. 1) Click on the report for the recent game against Chorley. 2) Replace the opposition players names with ones of your own choosing. 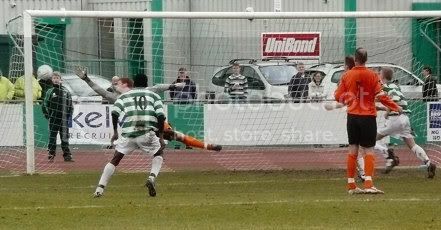 3) Skip over the part detailing Mossley's goal. 4) And the bit about injuries. Honestly, much of what is written there is equally applicable to yesterday's game in Yorkshire. After the weather enforced fortnight’s break, Mossley's league campaign gets back under way with the first of our two scheduled trips within the space of a month to Bradford Park Avenue. On the pitch though things aren’t going too well for ex-Mossley manager Benny Philips as Avenue’s promotion challenge is rapidly turning into a fight to remain in a play-off spot. In fact since I wrote that sentence Benny has become an ex-Bradford Park Avenue manager as well. Last Tuesday's home draw with Clitheroe turned out to be his last match in charge; the final match in a sequence of eight league games in which they picked up just two wins (though they lost only two as well). Also in the same period their first choice XI were beaten in a friendly by a visiting Ashton United side made up of trialists and fringe players. The managerial change has also instigated an influx of new faces on the playing side with five players signing on loan from Conference sides. Whilst it may look like an admittedly impressive transfer coup at first glance, those Conference clubs are Droylsden and Farsley who are both doing their best to stink the league out this year, and they're hardly likely to let the better players go. I mean look at our loan signings from similar levels last season! Away from the comings and goings on their bench, the attentions of Avenue's fans have been distracted by their chairman's announcement of a new sports complex that the team will be a central component of – primarily as the tenants of a 20,000 capacity stadium. Yes, 20,000! The owner obviously believing in the 'Field of Dreams' principle of “Build it and they will come”. The first meeting between the two sides this season took place back in August at Seel Park when Jamie Miller scored a late equaliser to earn Mossley a deserved point. 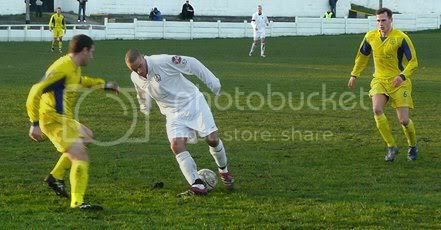 Turning out for Bradford that day were ex-Mossley players Adam Morning and Danny Meadowcroft but both have since moved onto new pastures on the Cheshire salt flats. Some ex-Lilywhites still remain in the shape of Jon Worsnop and Ross Clegg whilst Lee Connor will be playing his first game at the Horsfall Stadium since leaving Avenue to captain Mossley in the summer. Prediction: While there's the possibility that Benny's departure may give Bradford that adrenalin like shot to the heart (otherwise known as New Manager Syndrome), I think that Avenue are there for the taking and took they will be: Mossley to pick up their first win of 2008. With no midweek match to anticipate, attend or debate (other than those in the over hyped 'Rich Clubs Getting Richer' League or the UEFA cup), here are a couple of things that may distract you for a couple of minutes as you anxiously wait for Saturday’s showdown with Bradford Park Avenue to arrive. If they don't then why not attend the Mossley AFC Quiz Night on Thursday, 21st February at 8:00pm in the Seel Park Social Club? It costs just one, solitary pound to enter and it never fails to be anything other than a good laugh and a good night. And occasionally, very occasionally mind, it's informative too. Now the advert is out of the way, onto the clips; none of which I might add have been on any of the numerous, and frankly rubbish, TV programmes about internet virals and videos that have invaded our screens recently. Normally I'd go into a rant about cheap television but as I'm doing almost exactly the same thing as they are in order to cover up the lack of editorial content, it would be somewhat hypocritical. Who said that hasn't stopped me before? It's surprising how often blessings turn up in disguise, isn't it? 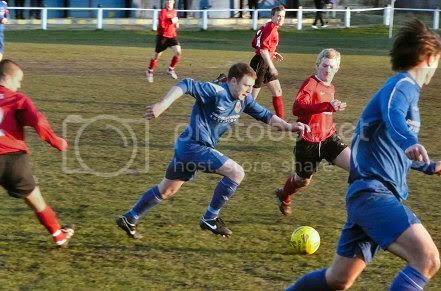 Take yesterday for example when I just missed the bus on my way to Mossley's match with Bridlington. Quietly muttering to myself about why they even bother having timetables when they don't stick to them, I bumped into former kit man Charlie who was making his way back from Seel Park. If I'd caught that bus I would have missed the news he imparted to me that the game had just been postponed and instead of being annoyed close to home, I'd have been stood outside the ground grumbling away. Given that the pitch has remained frozen on warmer days than Saturday, it was always unlikely that the match would go ahead; especially as the bird bath in the back garden (which like Park End of the pitch is always in the shade) was still one stick short of being an ice lolly at 2:00pm. So even as I set off I did so not really expecting to see a full 90 minutes of football, so I can't say that I was shocked. Slightly miffed maybe but not surprised. And at least I only had a five minute walk to get back home, unlike those coming from Bridlington whose annoyance at the match being called of so late must have been palpable. Following a few phone calls arrangements were made to take in another match. The late postponement meant that what was the fall back game of Radcliffe vs Curzon was now a non-starter due to the travelling time (coupled with the fact that it had also fallen victim to the weather), so with the lack of local games it was off to Bower Fold we set, the need to take in a game, any game, far outweighing my principles on not giving money to Stalybridge Celtic. The lack of cars parked along Mottram Road set the 'uh-oh' alert going and the fears that we'd just travelled to another postponed game were confirmed by the small number of people making their way away from the ground. With fingers crossed for third time lucky, we continued up Mottram Road towards Glossop in the hope of seeing their match against Silsden. After parking up in front of the KFC that now resides at one end of the Surrey Street ground we were met with complete silence, which could only mean one thing - yes, the match was on. If it wasn't you'd be able to here the twittering of the birds on the pitch. As games go it wasn't a bad one and once Glossop had taken the lead just before the interval there appeared to be only one outcome; the home side proving to be vastly superior to their opponents at things such as creating chances, passing, positioning... well, football basically. The second half continued in much the same way until the magic phrase, "The referee is having a good game" was heard to be uttered and immediately the man in the middle lost the plot. An optical illusion caused by the zoom lens shortening the distances between people or did Glossop have a really huge player among their ranks? Only those that were there know for certain. After awarding Silsden a penalty that the word 'harsh' doesn't do justice to (the successful spot kick being their only shot of the match), the referee reduced the home side to ten men with a straight red card for a challenge that was a yellow at worst. All whilst letting Silsden's small number 8 get away with nothing more than a booking for a series of tackles that were even poorer than his monumentally awful passing. In all honesty he was one of the worst players I've seen for a good while. How bad? Not fit to lace Fraser Robinson's boots bad. Even with ten men, and after substituting two of their better players, Glossop continued to be the side most likely to win and that they didn't was disappointing as Silsden deserved to head back home with nothing, rather than with a point from a 1 - 1 draw. 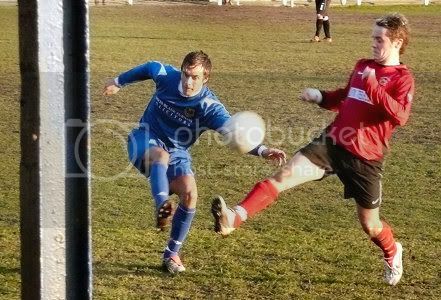 The Glossop right back successfully avoids the close attentions of an opposing player and a view obstructing post. Still, it wasn't bad for the £5 we were relieved of by the man on the turnstiles, and if Mr Quinn is still on the look out for a right back and a centre half to boost Mossley's ranks, he could do a lot worse than to check out a couple of North End's starting XI. A week after Newcastle made their second long sojourn of the season to Seel Park, its Bridlington’s turn to travel south west yet again. This is the fixture that was originally due to take place in the second week of December but thanks to the weather, what was scheduled to be their second visit of the season at the end of that month became their first... if that makes sense. Whether it does or not you'll certainly remember that second/first game as it was the last time Mossley tasted victory in a competitive match. Or to be more blunt, all seven games played in the meantime. Since that match Town have undergone a change of personnel on the sidelines which has seen their chairman ‘do a Dave Pace’ and take over as team manager. And he’s not done too bad a job either as Bridlington's form has steadily improved. Thanks to Chorley's upturn in fortunes though they still remain second from bottom of the league. Mossley sit ten points above them in 12th position but with many of the teams below them having games in hand, the reality is that this match is a ‘six pointer’ (or is it a nine pointer if we’re playing them three times in the league this season?). Prediction: Mossley's win less streak to come full circle with three points for the Lilywhites. The thing about non-league football is that you don't go to matches with hopes of seeing a good game because they're invariably tend to be few and far between. And Radcliffe vs Wakefield was no exception. It wasn't a good game, it was a very game and perhaps the best I've seen at this level for quite some time. The first half an end to end affair with both sides creating and spurning a host of chances, although to be fair to Wakefield, Radcliffe keeper Phil Priestley played a huge part in them not managing to find the back of the net with a string of good saves. The second period, while not hitting the heights of the previous 45 minutes, was just as engrossing and despite the Yorkshire side edging ahead in terms of chances and possession held, it looked as though a 0 - 0 was firmly on the cards. That was until moments from the final whistle when, out of nothing, an inch perfect shot was curled from the corner of Radcliffe's box, over the head of Priestley and off the underside of the crossbar to give Wakefield the lead. And as is often the case it was one of the worst players on the pitch that scored it; former Mossley player Will Ryder having spent most of the previous 85 minutes being one of two makeweights in Wakefield's four man midfield. That wasn't the end to the drama though as Radcliffe should have rescued the game straight from the restart. Steve Howson brilliantly created an opening for himself and then did something even more breathtaking - but not in the good way, knocking the ball wide of the goal from five yards out with only the keeper to beat. 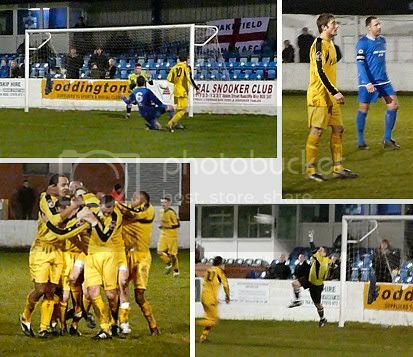 (Clockwise from top left) Priestley comes to Radcliffe's rescue in the second half; the Mossley supporters man of the match Pat McFadden in Wakefield's Bruce Lee/Kill Bill kit; Will Ryder's shot loops over Priestley and towards the back of the net; much to the delight (and no doubt shock) of his team mates. From a Mossley perspective it was interesting to see what Wakefield were like as we're still to play them three times this season, and what we saw gave us no cause for optimism when the first of those matches arrives in just over a fortnights time. They may be midtable like ourselves but they also possess the strengths that sides who've recently put us to the sword have had, i.e. two dominant centre halves, a commanding, ball winning midfielder (Jay Sobers) and two incredibly mobile forwards who like to run with the ball. They may well have only been playing Radcliffe, a team adrift at the botom of the league, but the home side weren't too shabby either as anybody who saw their recent game with us will testify. While there's an air of resignation around the Inn2Gether Stadium to the fact that they're likely to get dumped into the NWCL at the end of the season, they're certainly giving 'survival' a go and good luck to them. The last thing we need at the level we're at is local fixtures disappearing. According to the Wakefield statistician there was a total of 28 shots in the game with 13 being on target and as an alternative to staying in on a Tuesday night (whilst trying to avoid catching even the merest glimpse of the inane drivel that is Holby City), it doesn't really get much better than that. 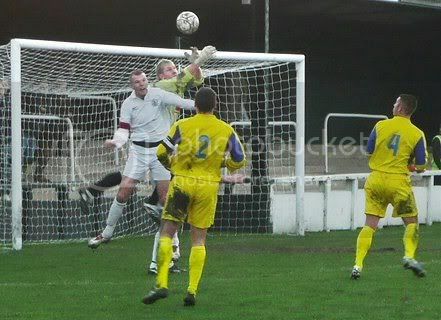 Yes, Mossley80 has match photos once again! Whilst a draw may not have ended Mossley's run of six games without a win, the point taken from this match was certainly a case of one won rather than two lost. In fact it's probably true to say that Newcastle Blue Star will have headed back to the north-east wondering how on earth they weren't taking all three points with them. The main reason for them not doing so though travelled back to Tyneside with them: number nine Lee Novak, who missed a catalogue of chances so big that it would give the Argos one a run for its money in terms of size. That is unless he's missed the coach as well. Novak expertly puts the ball over the crossbar from a difficult angle. Despite the presence of blue skies (and what those old enough to remember described as being) sunshine, the match got off to a grim start for the Lilywhites when Newcastle took the lead in the 7th minute; Mossley being made to pay the price for failing to clear their lines properly by Chris Emms, who headed past Ashley Connor after connecting with a deep cross from the right. Other than Leon Henry having a shot blocked by a defender in the 22nd minute, Mossley offered little in the way of threat to Lowson's goal, whilst at the other end of the field the Lilywhites defence were at times having their work cut out in dealing with Blue Star's attacks; the Geordies literally queueing up at times to have a go at goal. Thankfully though, just when it looked like the visitors would add to their lead, up popped Novak to direct the ball high, wide or both at the same time. One moment just before the interval summed up Mossley's half. A lack of communication between Daryl Weston and Jamie Miller saw both attempt to go for the same ball and only succeed in knocking each other to the floor, allowing the visitors to counter and Mossley needing a good save from Connor to prevent Blue Star from doubling their lead. Ashley Connor about to foil another Novak attempt.. The initial stages of the second half were no better for the home side or Lee Novak for that matter as he spurned two more good opportunities to increase Newcastle's advantage. Then out of practically nothing Mossley got themselves back into the game in the 53rd minute. 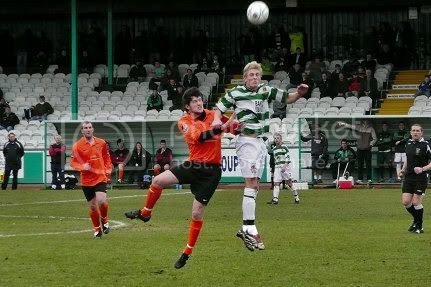 Hitting their opponents on the counter attack, a host of white shirts moved swiftly up the pitch and though Lee Blackshaw had his legs taken away from under him as he moved across the edge of the Blue Star box, the ball rolled along the 18 yard line to Michael Fish who hit a first time shot that flew past Lowson and pulled the Lilywhites level. With both sides in need of the three points (Newcastle for a promotion push, Mossley to push themselves away from the drop zone) the last thirty minutes or so were as open a game of football as there's been at Seel Park this season. End to end is an overused phrase in football but in this case it's true. Admittedly most of the chances were happening at the wrong end of the pitch from Mossley's point of view but thanks to Novak's continuing wastefulness in front of goal (I'd normally use the word profligacy but it already seems overused this weekend) and the combined efforts of both of Mossley's Connors and Dean Johnson (which included no less than three clearances from under the crossbar), Blue Star's goal tally for the match remained at just one. Though not creating chances quite as clear cut as the ones their guests were making, Mossley were at least managing to make Lowson sweat a little more than he did in the first half. Lee Blackshaw went close to putting the home side ahead with a 20 yard shot that wasn't far away from hitting the back of the net rather than the back of the stand, which incidentally was also the destination of Weston's acrobatic volley from Blackshaw's set-up. With time almost up it was Mossley who went closest to having the final say in the proceedings when, from fully 40 yards, Fish hooked Blue Star's clearance from a Mossley corner back towards goal, only for it to drop agonisingly wide of the left hand upright. Michael Fish undergoes the close attentions of the Blue Star defence. After a sequence of games were Mossley have appeared to have run out of steam before the half-time oranges have even been sliced, it's nice to see a second half performance from the men in white shirts. And whilst it's true to say that the game could have easily been over as a contest before then, its to Mossley's enormous credit that they dug deep and rescued the game. Even if it was with their only shot on target during the entire ninety minutes. Kudos also goes to Fish and Weston who, after being dropped to the bench for this game (despite being two of only a handful of players to emerge with any credit from the defeat at Chorley), both produced fantastic displays after being introduced to the match in the first half following unfortunate injuries to Richard Conway and Aaron Kirk. And is there any position on the pitch that Leon Henry can't play in? There's still room for improvement but hopefully the spring this comeback has put in our step will carry over to next week's 'six pointer' with Bridlington. The end result might have been the spoils shared but it's a point which Mossley will be delighted with, especially as it seemed at such an unlikely one at the midway stage of the game. And if Mossley were to repeat this outcome in their remaining twelve games, it's 99% certain that Unibond football will still be being played at Seel Park next season. In a league that has restructured under the pretence that it'll mean more local games and less travelling for its member clubs, you’ve got to feel some sympathy for Newcastle as they make their second lengthy trip of the season down to Seel Park. Still, rather them than us, eh? Their previous visit back in September finished with them heading back to the North East with absolutely nothing to show for their near 8 hour round trip and it would be nice to think that history will repeat itself again at the weekend. Blue Star at present reside in the glamorous position of eighth in the league (well it's more glamorous than twelfth), six points away from a play-off spot. Whereas Mossley are still looking for their first win since beating Bridlington in December. Hmm... Brid are a north eastern-ish side so maybe the arrival of Newcastle will help us to complete the circle on our 'annus (so far) horribilis'? Anyway, there are more pressing concerns for Mossley at the moment. Some of the whispers heard at matches recently regarding the financial state of the club have today (Friday) been confirmed in story carried by the Oldham Evening Chronicle. It's a bit of a beggar when you have to read about it in the paper but it's nice to have some light shed on the road we're currently travelling down. I'm sure that more eloquent musings on this subject will appear on Smiffy's blog in the near future so I'll derail my own ramblings on it here. As the Plastic Population once stated with the aid of Yazz: The only way is up! At least it is if you ignore everything in a downwards direction. Prediction: We've had the darkness so it's now time for the dawn: a win for Mossley. With recent results not exactly having gone their way, Mossley have begun to resemble a skydiver who, upon pulling the ripcord, discovers that they've packed a piano rather than a parachute into their backpacks. There's always a back-up though and a Chorley team coming off of a 7 – 0 hammering, as well undergoing upheavals on the managerial side of things, should have been Mossley's best chance of registering a win since everybody was still finishing off the leftovers at Christmas - their emergency chute. No one would have guessed though that that auxiliary option contained an elephant rather than a piece of silk. In the run-up to this match Chorley and Mossley had gone a combined total of twelve games without a win and straight from the kick-off it was easy to see why. Despite a good playing surface and some decent weather both teams struggled to get any kind of momentum going and, but for a shot by former Mossley forward Steve Burke that flew over the bar, there was little to nothing in the way of drama. That changed in the 14th minute when, with what was to prove to be a rare moment of quality from the visitors on the night, Mossley opened up the home side with their first real attack as Leon Henry and Paul Quinn combined to send Michael Fish into the box. The move was brought to a sudden and clattering conclusion when Fish was upended by an extremely rash challenge (and a needless one at that as the ball was running off for a goal kick) by Paul Collinge which gave Mossley the opportunity to take the lead from the penalty spot. And they did; Martin Allison calmly dispatching the ball into the net. Ten minutes and one long distance effort by Allison later, Fish was only centimetres away from connecting with a right wing cross that had he reached, would almost have certainly doubled Mossley's lead. Instead though it proved to be the visitors last real threat as an attacking force and less than sixty seconds later Chorley were level. Not for the first time (and certainly not the last) Mossley meekly surrendered possession in the middle of the park and set in motion Chorley's equaliser. Two passes later the ball was at the feet of Burke and the combination of speed and being a good three yards offside took him away from the Mossley defence and around Ashley Connor before he rolled the ball between the posts. The game then returned to its pre-goals state of error strewn play, broken up by the occasional half chance and low key appeals for free kicks, before springing into life once again as the interval approached The flurry of activity began when a deep cross from the left by Leon Henry turned into a shot mid-flight that had Collinge back-pedalling furiously before the cross bar came to his rescue. Sadly it proved not to be the final action of the half. 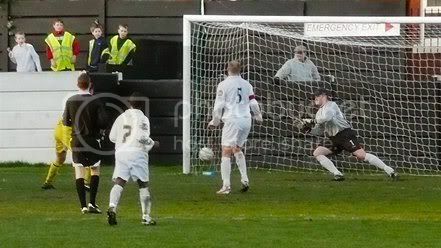 After the ball had rebounded back off the woodwork, Chorley broke quickly up field and won a corner that Mossley looked to have dealt with in clearing it towards the halfway line. 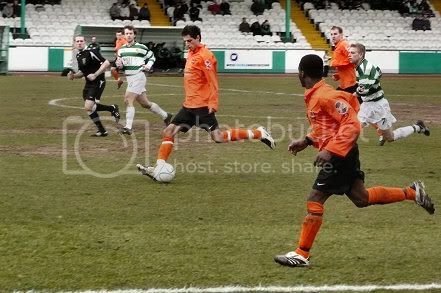 Back the ball came though and with Mossley looking like they were in the middle of game of musical statues than football, Nolan ran unchallenged through a crowd of tangerine shirts before squaring it to Burke who slotted the ball past Connor before squaring it to Burke who slotted the ball past Connor. And being perfectly honest, it was a lead that they never once looked like relinquishing throughout the remainder of the game. The only question seemed to be how many they'd add as the second half became almost exclusively one way traffic in the direction of the Mossley goal. In fact if it wasn't for some poor marksmanship and good saves by Connor, Chorley could have had the game wrapped up long before the hour mark had been reached. Whilst Mossley's recent performances have been, let's say, 'poor' it's hard to get away from the fact that a contributing factor has been the extraordinary number of injuries we've picked up recently, with Richard Conway and David Boardman becoming the latest to join the ever growing band of walking and limping wounded. So much so in fact that keeper John Paul Lewis was named as one of the substitutes and a fortuitous selection it turned out to be when Ashley Connor was forced to leave the field midway through the second half after picking up a knock. Despite an anxious opening few minutes to his first appearance in a Mossley shirt, Lewis soon settled into the role and produced a string of saves that preserved the Lilywhites faint (going on invisible) hopes of taking something from the game. His first was a full length stop to deny Nolan from firing in at an angle but his second was breathtaking - not only managing to stop Burke's close range effort with one hand when a goal looked the inevitable outcome, but also turning it away for a corner as well instead of into the path of incoming Chorley players. Lewis also played his part five minutes later in once again stopping Burke from claiming his hat-trick. As the Chorley number 10 galloped clear of the visitors back line and into a 1-on-1 situation with the keeper, Lewis spread himself enough to force Burke too wide to fire off a shot and then recovered to drop on the ball as it made its way back across the area. It was becoming increasingly clear that it would need something special to beat him and that's just what happened with six minutes left. Another sloppy pass allowed the Magpies to move forward and from a wide position Brookes floated the ball over Lewis's head and into the net to finally put Mossley out of their misery and, in doing so, heap more on them. There's no way of disguising it - this was a very poor result for Mossley. And a season that started off relatively brightly goes from bad to worse to rocking gently backwards and forwards, cradling your head in your hands and hoping beyond hope that it's all just a bad dream. That's not to say there weren't any positives on the night. Not only were the roads reasonably clear but we also managed to get under one of the stands managed to get under one of the stands before the heavens opened. Apart from that it was very grim fare from a Mossley perspective. Detailing what's wrong would see me typing from now till next and I still probably wouldn't be finished. I could list the current failings but if you've only seen one game in the last two months you'll probably all ready know what they are. What's wrong? Well instead of replying with the facetious answer of "What isn't?" I'll point you in the direction of Smiffy's blog where he's eloquently put into a couple of paragraphs what it would have undoubtedly taken me a couple of thousand words to write. I've tried to remain positive this season and even coming away from Chorley last night I was reasonably upbeat: we may have lost but with the injury situation as it is and the home side's resolve steeled by the fact that they were playing for their futures under a new manager, things were always going to be difficult for us. In the cold light of a winter's day though, having had time to think about it, I can understand why others saw it differently. New manager or not we were still facing a team who hadn't won for seven games and had just been destroyed in their previous game at the weekend keeping them firmly positioned in their second bottom placing in the league – if we can't give a team at their lowest ebb a game, who are we going to start picking points up off? I'll leave the final word on the match to a neutral observer at the game who also happened to see us at Skelmersdale: "Apart from a handful of players, Mossley just seem to be going through the motions." If that's the case, and it's hard to argue with him being one of the few, and I do mean few, Mossley supporters to have witnessed both games, then we'll be in a relegation battle before know it - if we're not all ready in one. Still, I'm keeping my fingers crossed that we can rediscover our early season form in time for the Newcastle game at the weekend. And despite the string of defeats and what I've written, it's still better than what was being dished up for us this time last season. Imagine what things would have been like had Fraser Robinson and Neil Briscoe been marshalling our midfield. But in the meantime, as we plummet to the earth accompanied by an elephant and a piano, the question is what now? It’s the first of many catch up games this Tuesday as Mossley head towards Chorley for a game that should have taken place three days before Christmas. Despite a month and a half having passed since then, there are only a couple of minor things that I can add to the preview I did for that game. The first is that the number of ex-Mossley players plying their trade at Victory Park has been reduced by two after Joel Pilkington’s decision to join Clitheroe and Kenny Mayers very recent departure from the club. Secondly, that run of form they were enjoying in the latter stages of the old year has since ground to a halt. I say "ground to a halt" when what has actually happened is that it has exploded into a million tiny pieces. Their less than spectacular sequence of results concluded on Saturday with a 7 - 0 walloping at the hands of Skelmersdale United on Saturday, in what turned out to be the last hurrah for their management team of Gerry Luckza and the aforementioned Mr Mayers; both being told not to slam the door as they left the club for the last time on Sunday. Of course we got quite the pounding ourselves against Skem but losing by five is considerably better than losing by seven; the unwritten rule of football being that any defeat that would be spelt out on the BBC’s vidiprinter, e.g. Skelmersdale Utd 7 (seven) Chorley 0, is embarrassing. Coincidentally seven and five are, coincidentally, also the number of games both Chorley and Mossley have gone without a win in the league. Instead of facing a club in the midst of a crisis though, Chorley’s incredibly rapid appointment of Luckza’s successor, former Kendal manager Tony Hesketh, means that Mossley will be facing a side desperate to impress their new manager. That said though, with no time to bring anyone in, those players will still be the same ones who conceded seven at the West Lancashire prefab at the weekend. Though just Radcliffe Borough stand between the Magpie’s and the foot of the table, there are only twelve points between us and them – an insignificant total when you consider that there’s still over a third of a season to go. Still, three points for the Lilywhites would go some way towards easing the fears of being dragged kicking and screaming into a relegation battle. Prediction: Chorley lost to Skelmersdale by seven, we lost by five - therefore it must be 2 – 0 win for us! However, as we all know life’s not that simple but I still think we’ll come away from Victory Park with a... err, victory. And a morale boosting one at that. Much to the surprise of no-one, Mossley's scheduled match at Ossett became the latest fixture this season to fall victim for the weather. The reason being snow. So in tribute to this rare (and brief) depositing of frozen moisture, here's a short film about why snow is fun - it allows those of us not mad enough to fool about in it to laugh at those who do. I'd like to point out that no-one was injured in the following clips... I'd like to but to be perfectly honest I've absolutely no idea if they did or they didn't. However, as they're all taken from various global incarnations of You've Been Framed, I think it's safe to assume to the only things bruised were a few egos so there's no need to feel guilty after you've laughed at someone being catapulted into a tree at a frightening speed. Even though the weather forecast suggests that there's more chance of TalkSPORT having two minutes of genuinely interesting football discussion on it than there is of any football taking place in Ossett this Saturday, should the MET Office turn out to be wrong Mossley will be heading to Dimple Wells for the second time this season, for our third and final league meeting with Albion. I say Mossley when it should really be Ossett Albion Old Boys, such is the number of their ex-players currently within our ranks. James Riordan, David Boardman, Leon Henry, Martin Allison and Danny Toronczak all used to pull on the gold shirts and Gerry Quinn spent a few seasons in their home dugout. At the present moment the aggregate score between the two sides is five apiece; Mossley having won the first encounter 3 - 1 back in September whilst Ossett triumphed 4 - 2 on their home soil last November. Since then both teams have had their ups and downs... Ossett the ups and Mossley the downs. Prediction: I don't think I'm the only who believes that this is a fixture that Mossley will surprise a few people in. Whether narrowly, comfortable, deserved or fortunate - a win for the visitors.